Ra276 Grand Bé M.K.B., K.V.U. Gruppe Festung St Malo, K.V.Gruppe Rance. Ra276 Grand Bé M.K.B. 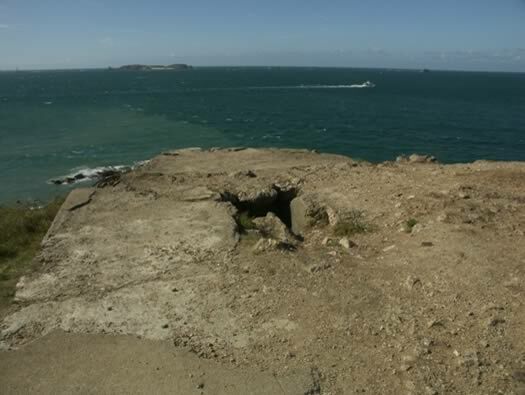 is a battery of four guns set on a small island just off the city of St-Malo. 1 x M162a/SK fire control. 1 x 5cm KwK SK/Schartenstand. 1 x 2.5cm Pak 112(f). 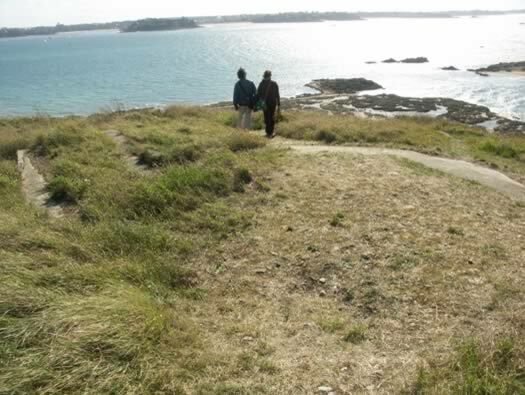 One of the many islands off the port of St-Malo & Dinard. German map of thier defences. Yellow is the parts of Vauban fort. The rest ids the batterie positions. 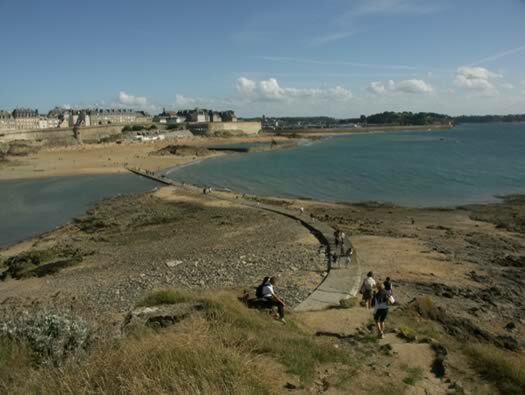 To get to the island of Grand-Bé first walk through St-Malo town centre or walk around the town walls to the seaward side. 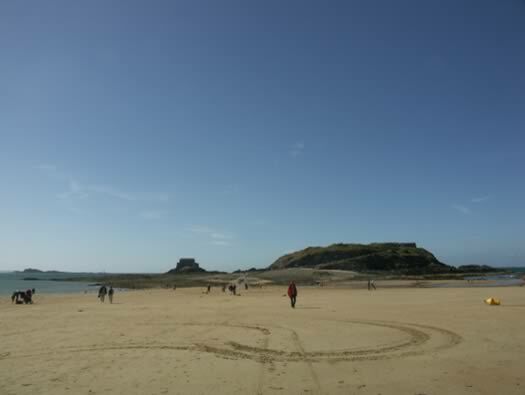 There are exits from the town to the beach where you can get out onto the sand and if the tide is out then you can continue on to the causeway across to Grand Bé. 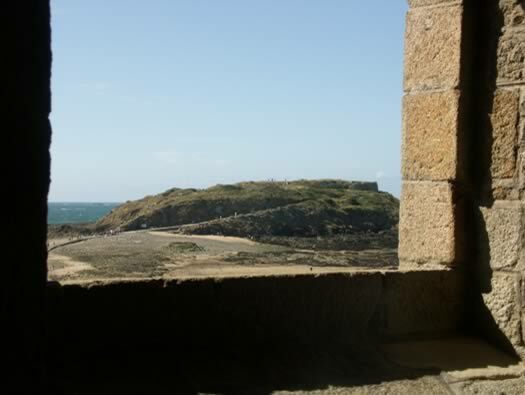 Inside the walls of St-Malo. The view in 1940 of Grand Bé with no guns. With the tide out and Ra116 Petit Bé to its left. 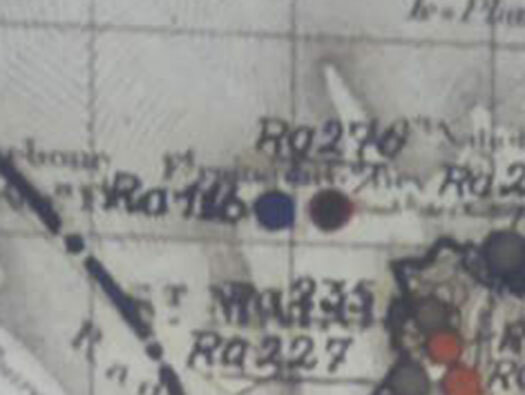 1 x R622 twin group bunker. 3 x R621 group Bunker. 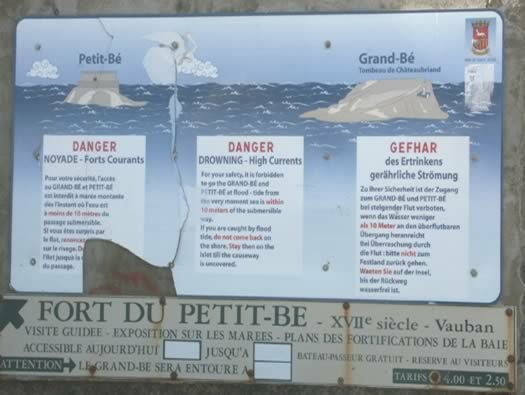 The notice in three languages of what not to do. 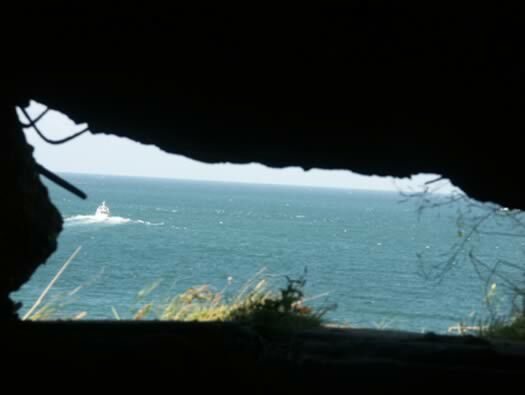 In the four casemates were 10.5cm S.K. L/40 guns belonging to 2/608 M.A.A. 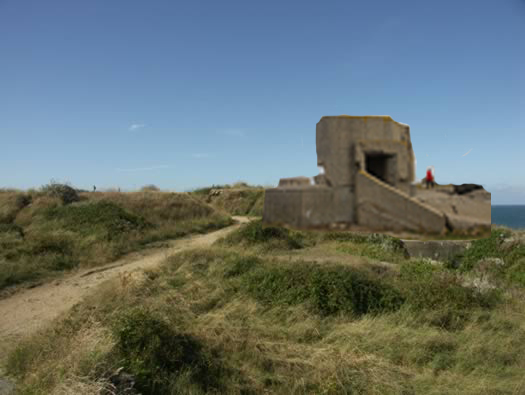 History: These four emplacements were ready by 1942. 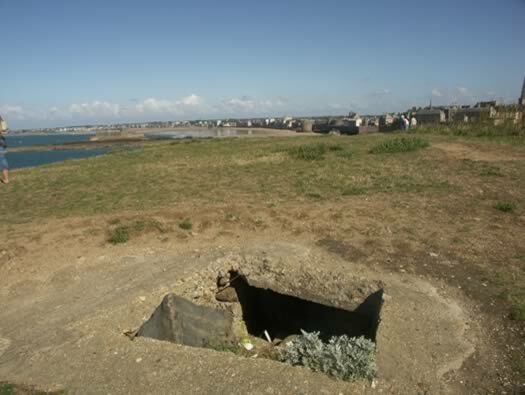 In 1944 due to heavy bombing of coastal artillery the order came down from HQ to casemate all artillery so caps were placed on the four emplacements and by May 1944 these were completed. 10.5cm S.K. L/40 in open emplacements with shields attached. Work starting on building casemates. Ra276 Grand Bé M.K.B. Vf machine gun position. 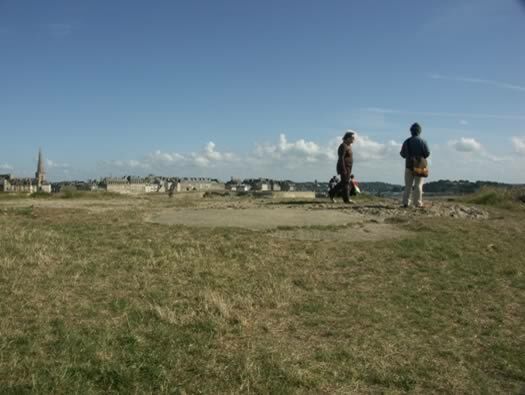 Starting the walk up and there is a small bunker looking back over to St Malo town. This looks like a local designed Vf bunker. (Vf: slight fortification or campaign). The island was bombed and shelled with light and heavy artillery as the Americans fought their way through the town. 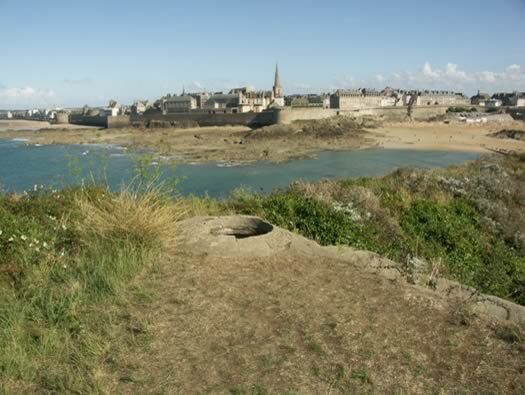 History: St Malo held out for quite a while to the American army. The German forces had spent most of the war digging themselves into the ground and with the use of tons of concrete and steel and were very hard to prize out. Brass casings small arms ammunition. Ra276 Grand Bé M.K.B. This is the remains of Turm 1. History: The Americans started attacking Grand Bé on the 16th August. Under a smoke screen they advanced to the island and then took the battery completely by surprise with hardly a shot fired and then captured all the guns crews in all a 150 men. Re used in the war as trenches. These Vauban walls have been rebuilt about 20 years ago. 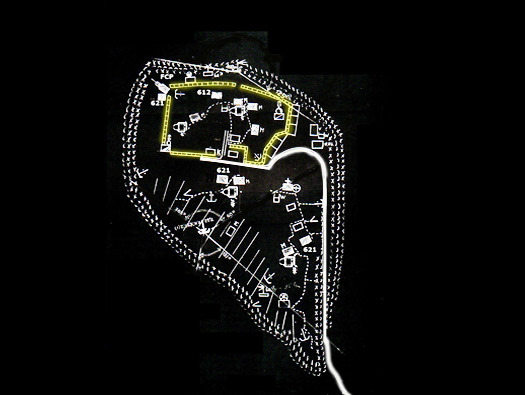 A plan of the Vauban fortress. Ra276 Grand Bé M.K.B. Fire Control Bunker M162a. 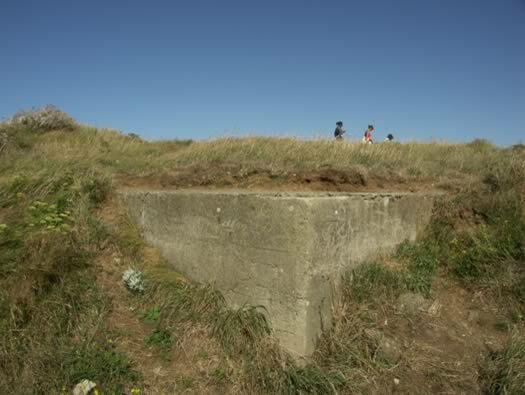 This bunker controlled all the guns on the island. 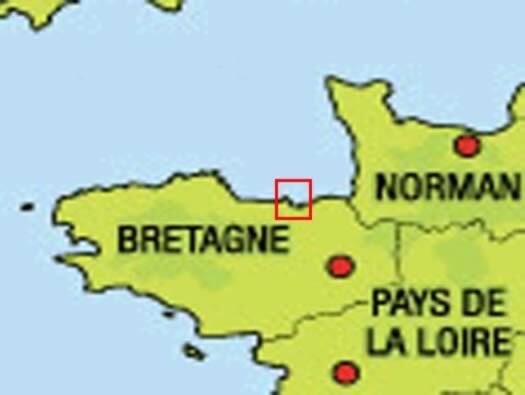 History: G Company of the 329th took the fortress of Grand Be and captured 150 prisoners. 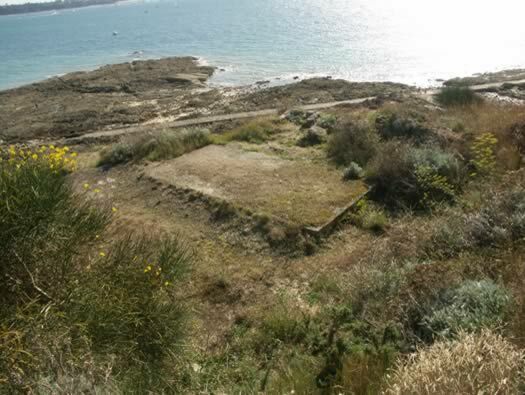 Also I have found out that the Americans turned the captured guns here onto the island of Cezembre to help in the subduing of that island. Plan details of its found at the Villa Maurice, Cherbourg 1/7/44 and were used by the Americans when they attacked it. Marineleitstand: managerial position shooting Marine. This is the actual M162a just after capture..
You have to crawl in through a small hole. It looks as though the four legs have been removed and the lid has dropped down on the bunker. The view through the slit. Ra276 Grand Bé M.K.B. 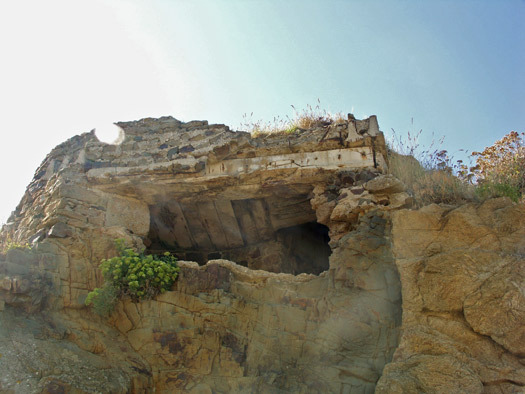 M158 casemate. 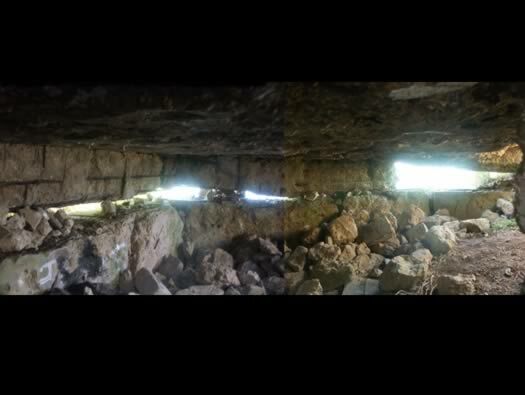 Another bunker roof with NO access inside. 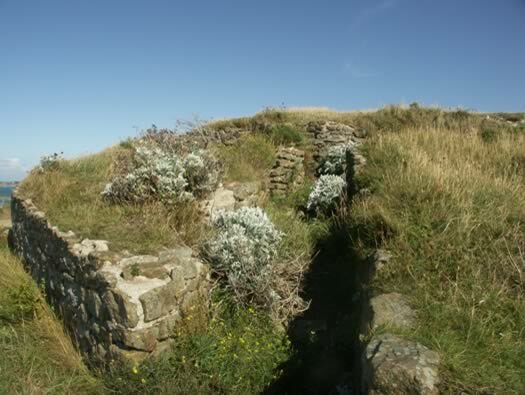 Most of these remains could be the bases of the large M158 casemates. M158 open emplacement (open emplacement). M158 with a cap on the top. Ra276 Grand Bé M.K.B. The Edge of a Bunker. How an M158 casemate may have looked. 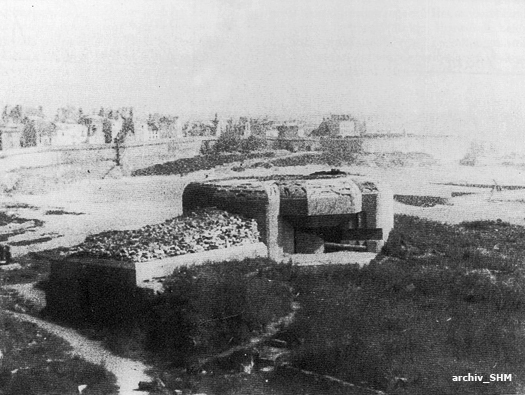 M158 casemate with its ammunition set out behind the lid. 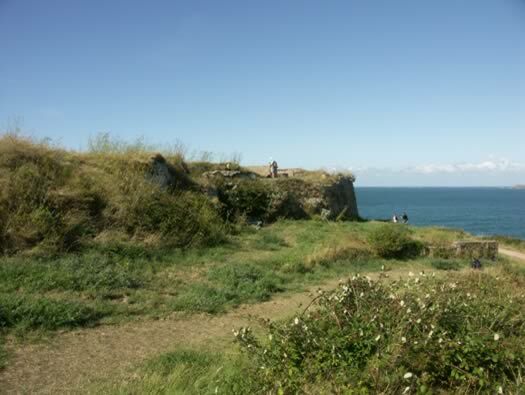 These three photos are from Batterie Neville, Normandy. Ra276 Grand Bé M.K.B. 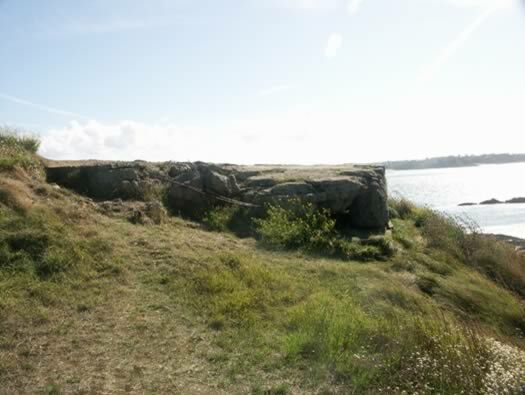 Another Base of a Casemate. There are remains all over the island. Ra276 Grand Bé M.K.B. Flak Position. 2cm Flak 38, there were two here. Ra276 Grand Bé M.K.B. Vf Ammunition Shelter Storage. Vf: slight fortification or campaign. Access to the ammunition room. 2cm Flak Emplacement and more parts of the Vauban Defence. 2cm Flak 38 on the island with Ra230 Fort de la Cité d'Aleth on the right..
A single group shelter with tow entrances a Tobruk defence and one large room. How it MAY Have Looked. I have superimposed a casemate on its foot print. 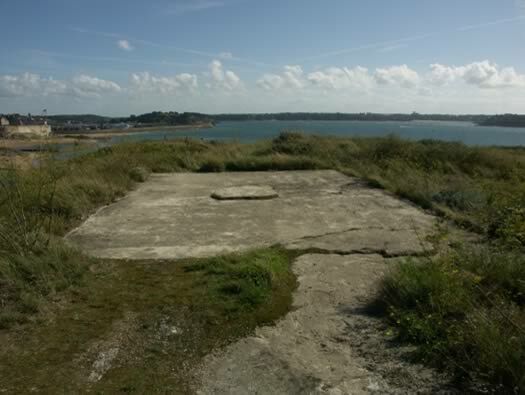 Foundations for a hut or a bunker? There was a toilet and small bunker here. Communal open toilet, gas masks are optional. You walk on stones that Napoleons men once marched. Ra276 Grand Bé M.K.B. 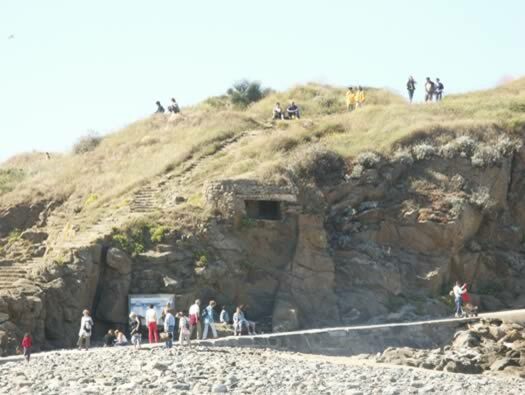 One of the Four Casemates. 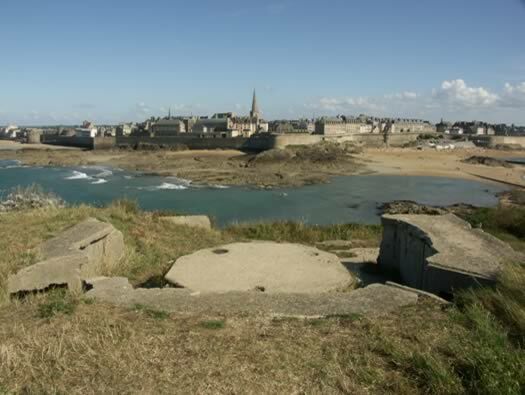 A 1947 photo, all the casemates have been removed so the people of St-Malo can look out and not see the slight on the island of Grand Bé. One of the Grand Bé guns being removed. 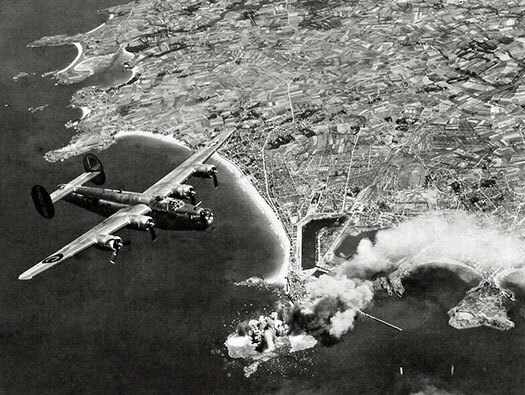 The American bombing of Grand Bé.